Urtica dioica, also referred to as ‘common nettle’ or ‘stinging nettle’ (so called as its leaves sting at the lightest touch), is used in Ayurvedic treatment to cure various ailments. At present, the herb has drawn a lot of attention, and plenty of research is being done on Stinging Nettle, with the popularity of the herb rising due to its immense health potential. The herb is administered in the form of juice, capsules, dry extract, liquid extract, as infusion and as tincture. To prepare Nettle Infusion, add 1 ounce or dried herb, or 2 ounces of fresh herb in one litre of water. Boil the water and store it in a covered jar and let it steep for four hours or overnight. Drink the herbal infusion within the next three days. Listed here are the Ayurvedic medicinal benefits of Nettle. Nettles are great for the kidneys and liver. They stimulate the liver and kidneys and help clear toxins from the body through urinary tract and bowels, thereby eliminating fluid retention in the body. Nettles also prevent formation of kidney stones and urinary tract infections. The anti-inflammatory property of Nettle leaves is worth mentioning. It helps relieve joint pain, and is an excellent remedy for gout, as it helps reduce the uric acid levels of patients suffering from the condition. According to Ayurveda, Nettles serve as an excellent nourishing tonic. They are used by women for extra nourishment during pregnancy and lactation, and during old age. Nettle works as a general tonic that provides energy and vitality by stimulating metabolism, and revitalizing the body. 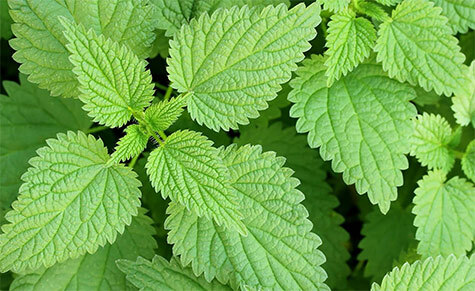 Nettle exhibits hemostatic properties, and is beneficial in relieving problems such as nosebleeds. Being a mild astringent, they help tighten and strengthen blood vessels, and helps maintain arterial elasticity. They help in treating skin conditions that occur due to high pitta like psoriasis, eczema, acne etc., by cooling the skin. To treat external skin and scalp condition, the stewed leaves or roots are applied as poultice at least twice a day. It also helps relieve intestinal gas and is good in alleviation of common vata-related intestinal problems. The roots are also used in treating dysentery, diarrhoea, inflammation and ulceration of digestive tract. The roots and leaves of the plant are used in Ayurveda in treatment of Asthma, as it helps open up the passage of lungs. The herb is an excellent expectorant, as it helps to expel phlegm. The juice of nettle leaves or the extract of the root are used as a wash for fistulas and gangrenes, and for clearing scabs or itch. Nettle leaves are beneficial in treating high blood pressure, anaemia and cystitis. The root of the herb is also used in treating enlarged prostate, abscesses, and herpes. Overall, the herb can be used as a general health tonic. But, it is advisable not to self-medicate. Discuss your health condition with your Ayurvedic practitioner, and consume the dosages as prescribed by the practitioner.